Dementia Friendly Sowerby Bridge is a newly-formed organisation which aims to make the town a dementia-friendly community. This can make an impact on the lives of people living with dementia in the area and it will be looking at all aspects of local life to see what can be done to make it more dementia-friendly. 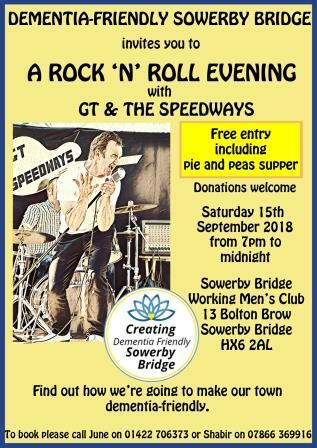 They will be kicking things off on Saturday 15 September, 7:00pm at Sowerby Bridge Working Men’s Club at Bolton Brow with ‘GT and the Speedways’, inviting local people to attend to hear more about what they want to do, how you can help us and, of course, to enjoy the music. Dementia Friendly Sowerby Bridge is a newly-formed organisation which aims to make the town a dementia-friendly community. This can make an impact on the lives of people living with dementia in the area and they will be looking at all aspects of local life to see what can be done to make it more dementia-friendly. What a way to kick things off on Saturday 15 September, 7:00pm inviting local people to attend to hear more about what they want to do, how you can help and, of course, to enjoy the music. This entry was posted in Events, Get Involved / Have Your Say, Health, Sep, Sowerby Bridge, Staying Well and tagged Dementia, Dementia Friendly Sowerby Bridge. This session will raise awareness around Dementia and help participants to understand more about the condition and explores how they can become involved in the Dementia Friends campaign. This entry was posted in Get Involved / Have Your Say, July and tagged Dementia, Dementia Awareness, Health, july, Training, Voluntary Action Calderdale. Go along and join in with stimulating and uplifting singing sessions beginning with some social time over a cup of tea or coffee followed by some gentle physical and vocal warm up actions before singing. The group welcome people with dementia and their carers and don’t mind if you have no experience of singing with others, as it’s about finding your voice and just enjoying the moment. 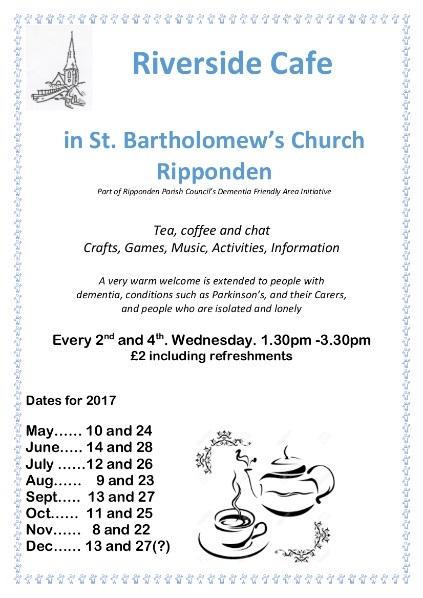 This entry was posted in Dec, Elland, Get Involved / Have Your Say, Nov, Oct, Sep and tagged December, Dementia, Elland, Get Involved, Hamerton Close, November, October, September, Singing.